"Christians are like the flowers in a garden, that have each of them the dew of Heaven, which, being shaken with the wind, they let fall at each other's roots, whereby they are jointly nourished, and become nourishers of each other." I'm sending this out a day early so I can wish you a Happy Valentine's Day. I hope it's already a good one. Whether there's any earthly "valentine" in your life or not, you're the Bride of Christ every day and He absolutely adores you and is crazy about you. You are a delight to Him and He loves you so much! This is our New Testament Savior, Lord and Lover of my soul. He transforms us through His love. Each day I take time to lie back and visualize Jesus and me on the beach dancing. I have a long purple free-flowing dress and He has white pants and tunic with a purple sash that blows in the breeze as we spin before the waves. There is no better "valentine" than that. Although I sure do appreciate the valentine I have in my husband. 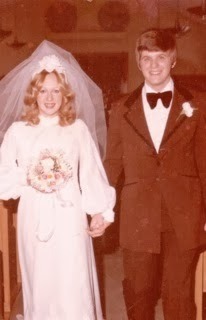 We've been valentines since 1977. We actually got engaged on Valentine's Day that year. I've seen some birds scouting out our bird houses. Flying to the hole and looking inside, sometimes hopping in to get a closer view. Nice to see that the birds are thinking of Springtime! It also tells me that birds plan ahead. We had a lot of cardinals and titmice birthed last year and I know some of them are going to have to find new territory. I hope there are plenty of places on our property. Don't like to think of our babies having to get out into the real cruel world, but our Father will watch over them. The titmice seem to be more gracious with each other than the male cardinals. The titmice use bird houses and cavities, so we can always increase the houses, but cardinals build their nests in cedars, vines and dense bushes. Since the female spends a lot of time in that nest, she checks all angles of the chosen spot peeking through branches to check on her views and privacy levels. When the spot is determined, she will build the nest, but males sometimes brings some materials for her to add to it. Both of these species have been singing their spring songs, which means the new males birthed are looking for mates. 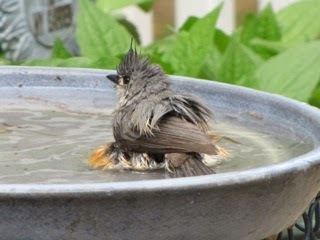 That may be why the titmice have been bathing frequently even on cold days. It's cute to watch them. They only take a dip or two, not like in the summer when they simply soak themselves silly. The chickadees watch and take a dip now and then also. Our most frequent bathers are definitely titmice all year around. They just love bathing and cleaning up. Speaking of birds, the annual Great Backyard Bird Count begins today and runs through Monday. Pick any day or do it every day and submit your best results. You simply choose a segment of time and count how many of each species and then submit the highest numbers. It's fun to check out your previous years' statistics and compete with them. Last year we counted 79 birds in a given hour and had 20 species in that list.It's one of our Valentine's Day activities this year. It's a lot of fun to participate, especially if you have children. They get so excited counting the birds and trying to beat the high number before entering your data at the BirdCount.org website. The skies put down almost a foot of snow in the past two days which is a lot for Central Virginia, but not as much as they predicted. It'll be easy to count birds against that white background. With our many weeks of very cold weather that certainly challenges the wildlife to eat enough food for energy. I had some expired brown rice cereal that was given to me, so I cooked it up in a 3-quart saucepan and dumped it all across one of our concrete benches at the pond, which is near the area where our wildlife look for the scraps we put out. I wondered if it would make a mess of the bench or even if it would be eaten, but by morning there wasn't a trace of it. I happened to have a little bit of peanut oil that I poured off of a new jar of peanut butter since we get the natural kind. That gave it a great smell to attract anybody that was in the vicinity of the bench. The fat itself would've been a great addition to the protein and carbs of the cereal. It certainly seems like they're not fussy tenants of the woods this year. Anything seems to be appreciated. 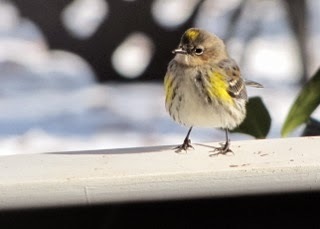 We've been seeing the Yellow-rumped Warblers this year, but not as many as last year. It's interesting that many of our normal wintering over birds seem to have flown further south. They must've known something about this winter. Warblers are very adaptable and found in a variety of habitats. They have a tremendous range reaching up to generally 9.8 million square kilometers and being found in much of the Caribbean as well as parts of North and Central America. There are also populations in Greenland, Iceland, Ireland, the Netherlands, Portugal, Spain and the United Kingdom. 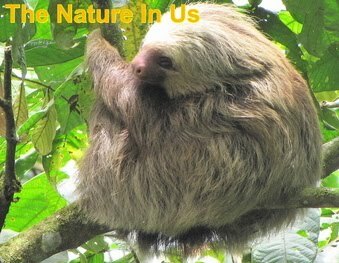 Its preferred habitat includes temperate, tropical and subtropical forests, shrublands and even rural gardens. The global population of this bird is estimated to be around 90 million individuals. You can see why they are called adaptable birds. They like the mealworms and the suet here in our habitat. The bluebirds come for the same menu which is served together on the deck, and they seem to chase away these warblers if they arrive together. 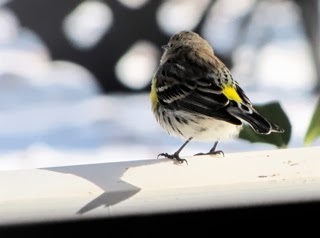 That has shown me that the Yellow-rumps are a bit timid because they fly back into the holly tree at the end of the deck and wait for the bluebirds to leave. I'm still attached to the tubing of the oxygen concentrator. I certainly give a lot of thought to a couple of years ago when God healed this through His mercy and the prayers of faithful friends. I was in such shock (unbelief) that I was head over heels grateful and continually praising Him, but to the point of simply not believing He did this for me. If you go back and read a lot of what I was writing after that event, it's obvious. It opened up the door to the devil who gradually (and gladly) led me back to where I was. 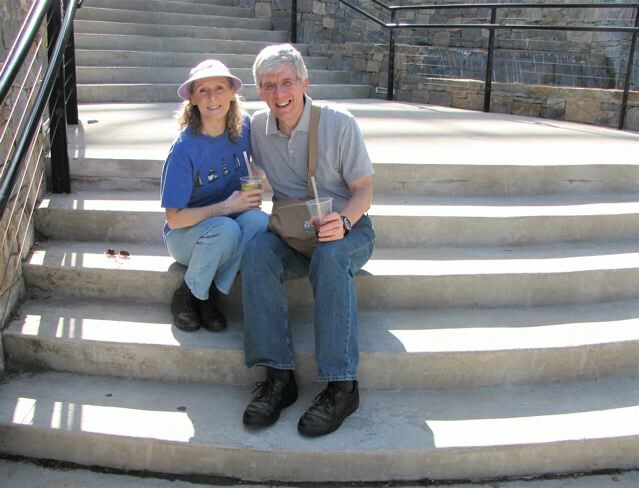 As mentioned in the last newsletter, the rheumatoid arthritis (RA) was healed at that time, but I was so much more affected by the heart/fluid retention/breathing being healed that I didn't think much about the RA I'd had for 25 years. In my mind, it was kinda like, "well if it is, that's great" but my heart was a more pressing issue. So a couple of months later it really hit me as fact that the RA healed and having that much time pass without much thought of it didn't negate the faith that came from Andrew Wommack to heal it. Funny, there was a time when I thought I had all of this figured out, but God's ways are inexhaustible. GREAT is His faithfulness. I'm not staying stuck here. Thank you to all who have been praying for me. I am spending a lot of time lying on my Abba's lap asking for mercy. His mercies are new every morning and His love for me is always fresh and new. I will find my way back to that healing manifestation because the Word is Truth and it says that Jesus has already provided healing. Our hardened hearts keep us from standing in faith. The disciples had just participated in the miracle of the loaves and fishes, feeding 5000 men plus women and children. With that many people, the disciples were NOT running back and forth to get the food from Jesus who was multiplying it. Jesus had prayed over it and put a tiny bit in each of the disciples' baskets and as they went to their assigned group in that huge crowd, each person took and the food kept multiplying right before their eyes. 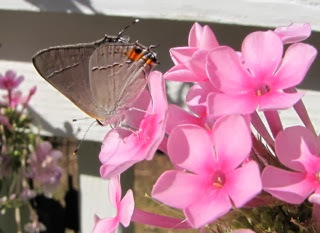 Don't You Miss The Butterflies & The Flowers? We think if we'd had that miracle of the loaves and fishes happen from our hands that we'd have the faith for anything! Most of our "knowing" is mental, not from the heart, and it's from the heart that we show forth faith. That's why so many Christians are confused about why things don't happen. It takes faith to bring God's blessings and promises into our lives (Hebrews 11:6) and we think because we know something mentally, that we know it in our hearts. Sadly, not so. How comforting that God knows we are but dust. I've been studying the Scriptures in the Gospels of the times that said that Jesus was moved by compassion for people. He still is and all we need to do is add a mustard seed faith to that to receive all of the blessings He has already given us in the spiritual realm. Marilee not only sent me the quote in this issue of the newsletter (at the top), but also this graphic. I thought it quite appropriate for Valentine's Day. Everybody needs more hugs. Although she and I both already knew the value of hugs, it was nice to be reminded. • Can instantly boost oxytocin levels, which heal feelings of loneliness, isolation, and anger. • Lift one's serotonin levels, elevating mood and creating happiness. • Strengthen the immune system. The gentle pressure on the sternum stimulates the thymus gland, which regulates and balances the body's production of white blood cells, which keep you healthy and disease free. • Relaxes muscles. Hugs release tension in the body. 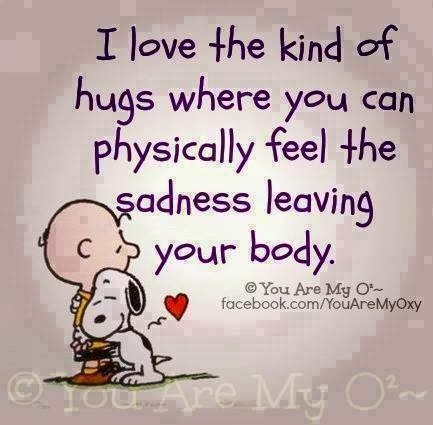 Hugs can take away pain; they soothe aches by increasing circulation into the soft tissues. How many hugs have you given out today? And what a great "love day" to begin this daily habit for the entire year. Love, Hugs and Many Blessings! Coffee Increases or Decreases Risk of Heart Attacks?